On Saturday July 14, 2012, Elizabeth Ann Sovis a 63 year old cyclist from Edmonton was cycling in Prince Edward Island with her husband. 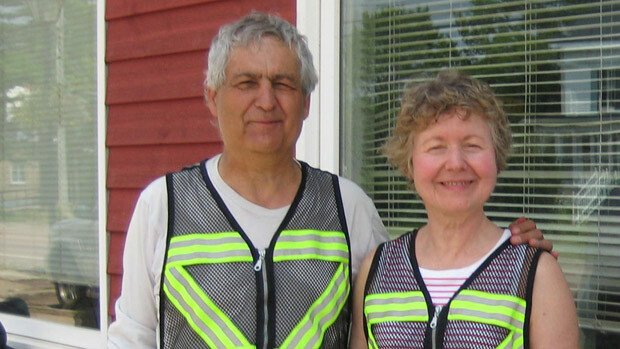 Elizabeth and her husband had been riding on the Confederation trail but had to leave the safety of the trails to get to their lodging for the evening. This involved riding down a 2 land stretch of highway not unlike most highways in Prince Edward Island. Sadly also on this highway was a drunk driver with 4 previous convictions. He struck Elizabeth from behind and fled the scene. He returned a short while later, failed a breathalyzer test, and was taken into custody. How is it that somebody who obviously has zero regard for those around them can be allowed to continue to act in such a reckless manner. After his fourth conviction it should have been obvious that he had no intention of ever changing his ways. He should have had a ban on driving for life, anybody who knowingly allowed him to drive should be treated as if they themselves were driving under the influence. At this point I can't decide which is worse, the idiots who drive drunk, or the morons who let them. Take their keys, block them in, do whatever you need to do, if that doesn't work call the police and report them. You just might save a life. Photo from the cbc.ca website.